I just chanced my luck by going straight to the National Theatre in London in the hope of getting a ticket for Shakespear’s Timon of Athens, which had had rave reviews. I was asked whether I was over 60, and when I answered in the affirmative, I was given a very good seat in Row H (8th row) at a price that would not have got me into a musical in Bangkok. This is how a “National” Theatre should function. What I saw on stage in the afternoon of 16 September 2012 was a very apt “actualization” of ancient Athens into the framework of the 2011 world economic crisis. The play itself was an unfinished work, which experts believe Shakespeare wrote in collaboration with Middleton. There was not much of a plot, and it gave the impression of remaining fragmentary. It was the superb acting, characteristic of the British theatre, (as distinct from the imposition of “concepts” upon any classical texts by contemporary German theatre) that carried the day. If translated and adapted into Thai now, Timon of Athens would very well reflect a society plagued by “kilesa”, especially when money and money-mindedness corrupted the entire society. (a “saleng” in our Thai context), awakening to reality when all material attachment has been lost. But all is not lost. Our “saleng” discovers an underground trove of gold. (What a silly plot!) He has become wiser now. When some of the false friends come back to him, he humiliates them. He uses his new-found wealth to support prostitutes to spread venereal disease and a rebellious Athenian to round up insurgents to subdue Athens by force. As for himself, he has had enough, left behind a biting epitaph, and disappeared. Some scholars think he commits suicide, some say we don’t really know. As a story, it is not the sort of stuff that a great literary work can be made of. Let us face it: the play survives because of its language. Those great lines are memorable, and the dialogue is theatre language at its most impressive. We don’t have to care about the impossible plot. Why did Shakespeare leave it unfinished? I think a Buddhist could perhaps find an answer. Almost everybody in this play is plagued by “kilesa” of all kinds, except for one person, the steward Flavia/Flavius, whom Timon recognizes as the only decent human being. Timon knows no forgiveness, and his way of taking revenge by force as well as by a contagious disease is just childish. How could a great poet leave as his legacy a play that treats of human baseness without a glimpse of remedy, let alone redemption? That money corrupts, we know only too well. Der Besuch der alten Dame (The Visit) both in its theatrical and cinematic versions is a potent reminder. Timon of Athens is a dead end, a “huis clos”, unworthy of a great poet, and he never staged it, nor did he want to publish it in his lifetime. The ending is “irresponsible”, to say the least. Those who know Molière’s “The Misanthropist” (Le Misanthrope) may have to admit that the French poet knows how to hurl back the responsibility to the public who has left the chief protagonist, Alceste, in his “little corner with (my) black misery” (dans un petit coin sombre avec mon noir chagrin). Why did the National Theatre decide to put it on at this time? The answer is very simple: it is timely. The modern dress and the set depicting high-rise buildings bearing logos or names of world-famous financial institutions are just an outer garb. Beyond that, the National Theatre has a pool of very able actors and actresses to constitute a very large cast demanded by the text. Without these players, Timon of Athens would have turned out to be just a good text for a RADIO PLAY which one can enjoy hearing. Of course, Shakespeare and Middleton knew the theatre well enough at least to leave a text out of which a lively performance could be staged. It may be good that the authors did not offer a way out of the dilemma; in other words, they might have believed that human “kilesa” is incurable. 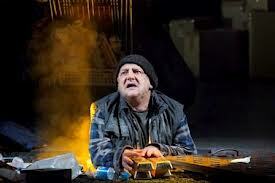 The recent and present world economic crises make Timon of Athens even more current and relevant. A National Theatre has taken up the responsibility to hold up a mirror to society, and people do not shy away from it. Tens of thousands have seen it, appreciated it, praised it. And many, many more will pack the National Theatre in forth-coming performances. We do not have a National Theatre that caters for this type of work. But we have innumerable small troupes which have been doing serious work by way of the theatre in spite of all the odds. Many have gone bankrupt for lack of public. We have only the public for musicals, especially those based on petty domestic issues. I have come to Germany to lecture on “The Lean Theatre (Lakhon Phom) in Thailand”, which I think shares the same ideal as the National Theatre on the South Bank of London, namely, that ART SHOULD FUNCTION AS A VOICE OF CONSCIENCE TO SOCIETY, the only difference being that the British have an audience for it, but we don’t. Let me conclude with a small point. The National Theatre assigns the role of the steward to a woman, thereby departing from the text. A concession to feminism, the only decent Athenian being a woman? Could we have our own brand of feminism, whereby our “leading lady” abandons those male rogues around her to embrace virtue? Or will that happen in “the late afternoon of our next life”?